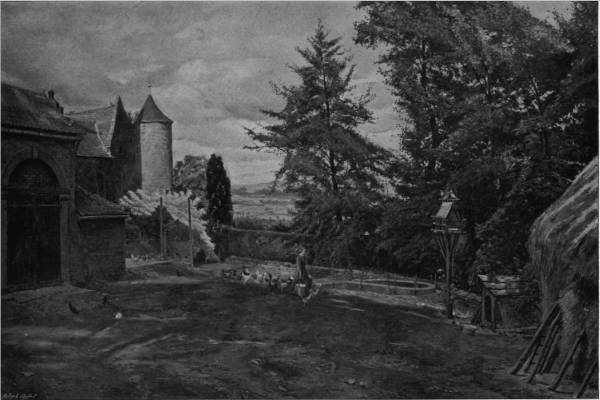 This picture shows a scene at a chateau owned by Madame Achille Adam at Outreau near Boulogne, and was begun by Crowe in the late summer of 1899. Under the title ‘Feeding the Chickens’, it was offered for sale at Sotheby’s on 6 October 1992, reaching £760. It was offered for sale again at Christie’s in South Kensington, London, on 9 March 2005 (lot 274), at an estimate of £1,200 – £1,800, but was not sold. A colour reproduction of the picture appeared in the sale catalogue. It was offered again on 21 September 2005 (lot 189) by Dreweatt Neate auctioneers, at the Donnington Priory Salerooms, Newbury, Berkshire, where it was sold for £800. On 11 November 2013, it was sold at auction by Strauss and Co as lot 1 of the South African and International Art auction at the Wanderers Club, Illovo, South Africa. It had previously been owned by the Everard Read Gallery in Johannesburg. The hammer price was 14,000 Rand (£847).